One of my favorite bedroom design elements is an all-white, plush bed. And lucky me, I've got one! Earlier this week, I put our crisp, fresh white spring sheets on our bed. Spring sheets, you say? Umm, yes. Well, more like non-winter sheets. I'm a little embarrassed to admit this, but it's the truth... during the winter, David and I use dorky flannel sheets on our bed. You'll have to cut us some slack- while I love our 1952 abode, it's not the best in terms of insulation, so it can get a little drafty in the winter! Obvious choice? Go lumberjack style with sheets like these. And just for some further inspiration, here are some gorgeous all-white bedding inspiration pictures. Are you an all-white bedding fan? Or do you prefer duvets with lots of color and pizazz?! I have all white bedding, as well as my 4 kids. It's a good investment, no matter what color I paint my room or my kids room their bedding will always match!! I like a simple bed. Can't go wrong with white . Love your spring sheets! I love white, and I love how I can just toss my white duvet in the wash with color safe bleach. 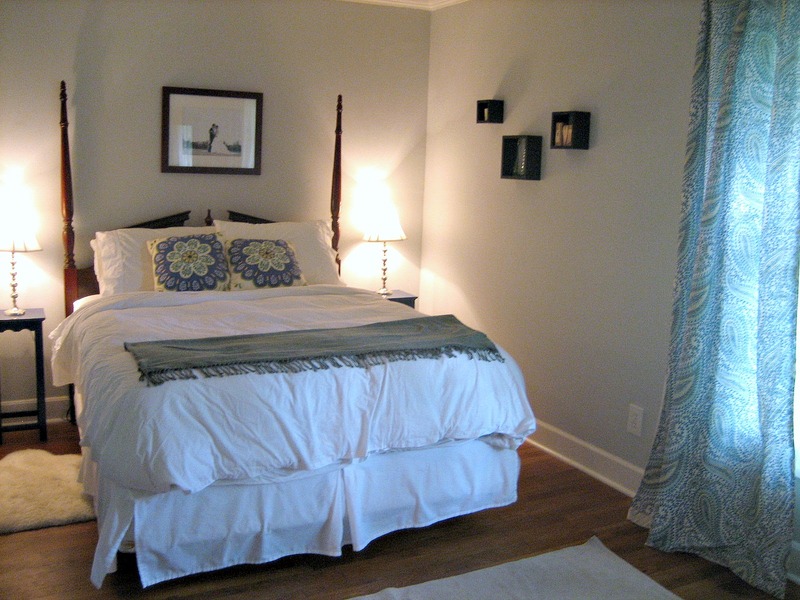 I also love the color and pattern that you can add with white bedding. Your bed looks so cozy. I love that look. Great look, Michelle. You can't beat white for summer! Easy to match accessories with. Love the color on your walls, too. That last photo is jaw dropping unique! I am totally an all white bedding kind of gal!! LOVE your bedroom! It's perfect! Oh you are cracking me up with the flannel sheets! I am an all white bedding girl as well. Something so refreshing and calm about it. 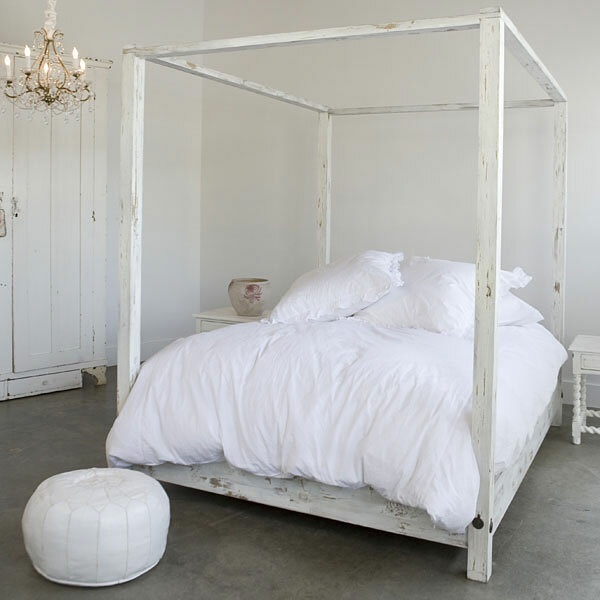 Love the idea of an all white bed...it's so calming and clean, which are both good things to describe a bed!! :) Yours looks pretty and love the curtains! Me too, love all white (ours is a bit more ivory). Love being able to change out accessories for the season easily. I love a white bed too, it is so relaxing. Your bed would look great with something at the end. A bench or ottoman of some sort. Love your bed! So funny about the flannels... My bedding is all white, too and I don't think it will be anything other than white for life! Its just so calming and clean and fresh! I'm also a huge fan of all-white bedding. 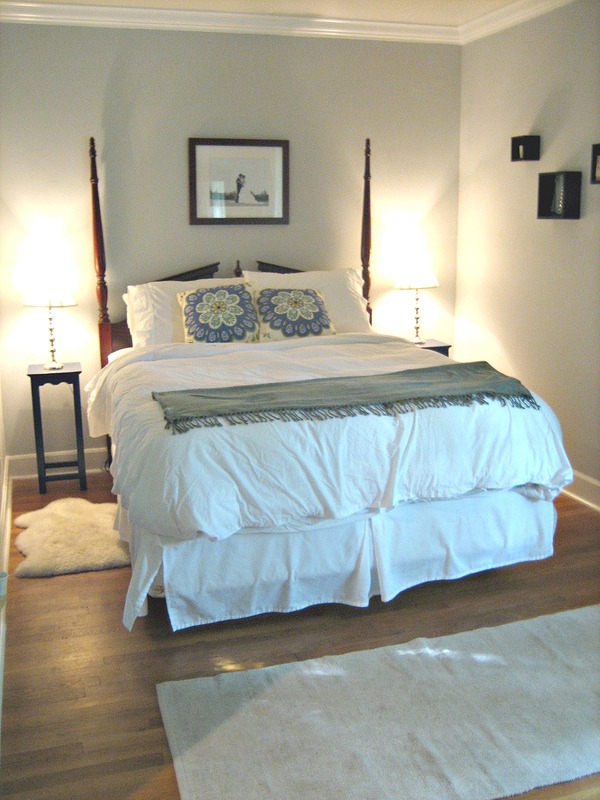 The master and guestroom in my house both have crisp white sheets, and crisp white duvet covers - but with colourful throw pillows. Swoon. Makes me happy all year round! All white beds are my faaaavorite! But with a nearly black cat that sleeps at the end of my bed all day? It doesn't really work :( Though sometimes I just put an accent blanket folded at the end for him to sleep on, it's still risky! are you kidding me charlie/rhonda? I totally bust out the flannel sheets in winter. they are soooo comfy and waaaarm. I love big plush white beds. totally my favorite. White bedding is my favorite! 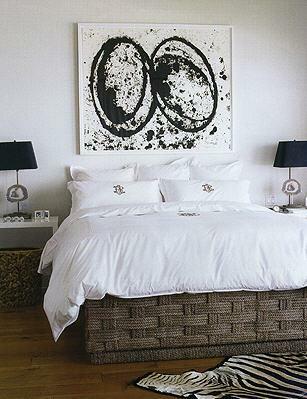 I can't wait to have a big bed sporting a fluffy white duvet (: I love that first inspiration picture! oops, make that slate. i don't need a fresh clean slare. I LOVE all white bedding but I'm always afraid it will get too dirty too quick! Nothing better than crisp white sheets! Love your wall color too by the way. I ADORE all-white bedding! Its just so clean-looking, soothing, calm, and relaxing. I can't imagine ever changing my mind about this. I just love it! I have an all white bedding set!! I have the Ruched Voile duvet set from Pottery Barn..I used to have it in my master, but right now, it's currently on my guest bedroom. I love white!! Love the fact that you have flannel sheets! What a funny little secret! 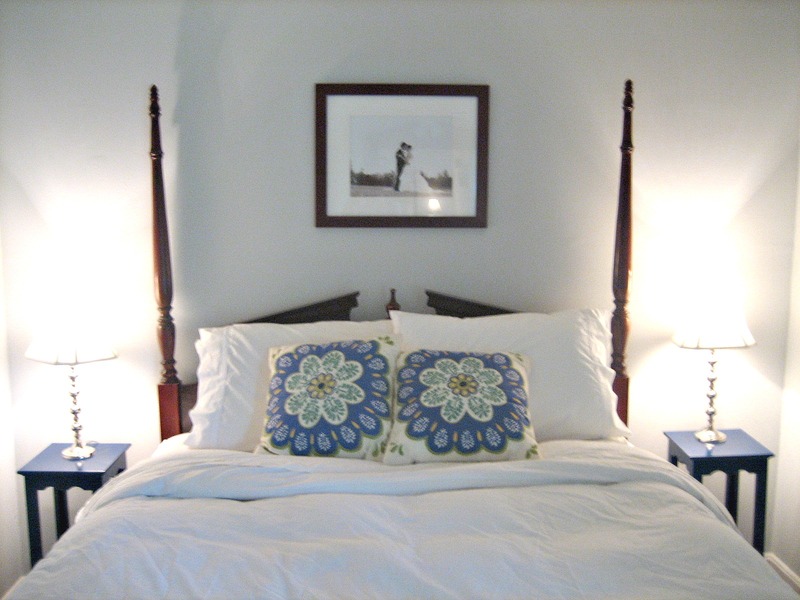 I am with you -- keep your bedding neutral and then you can change things out to mix it up a bit. I'm also a flannel sheet gal and just packed our set away for now. I think they are so cozy. I'm also a white bed gal. 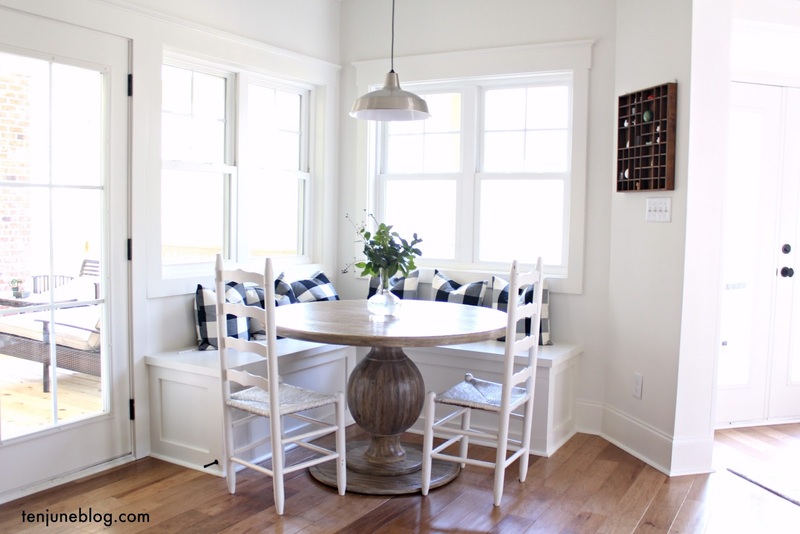 It is so peaceful looking and fresh and it's fun to use pops of color in the pillows and curtains. 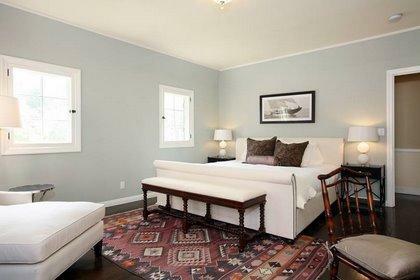 Your bedroom is very pretty. i love all white bedding too! so fresh, clean, crisp!! I have white bedding too, and I adore it. So fresh, clean and cozy! Mchelle, I'm redoing my bedroom at the moment (but not replacing the sheets!) and I'll admit I have a little curtain envy. Would you mind sharing if you sewed your pretty paisley numbers, or purchased them pre-fab? I'd love to know where to get my hands on them, or on the fabric, if you don't mind sharing. Many thanks! Hi Sarah Jane! I actually made the curtains that hang in our windows and in front of our closets (same fabric, which is from JoAnnes). The tutorial on how I made them (no sew!) can be found here: http://www.tenjuneblog.com/2010/08/before-after-master-bedroom.html. Thanks! I'll head down to JoAnne's tomorrow. The paint's drying in the bedroom so it's time for curtains. I'll be so glad to be done with blinds! Thanks again. Love your blog and your style.